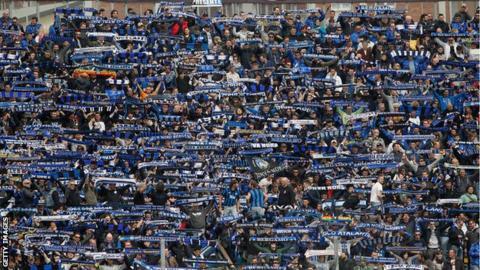 Atalanta fans interrupted their team at training to deliver a 10-minute lecture on how to improve their poor form. An open session at the team's Stadio Azzurri d'Italia base was stopped by protests from 1,500 supporters, with the players then lining up to listen to one of the fans' criticisms. "We're fed up with losing face," said Claudio Galimberti according to newspaper Gazzetta dello Sport. He also told the players to stay out of nightclubs and act as "professionals". "We do not want to see the opposition controlling the game on our pitch, we have become a home for other teams," Galimberti was reported as saying. Atalanta are four points and one place clear of the Serie A relegation zone after picking up six points from their last 10 games in the Italian top flight. They host Sassuolo on Sunday.